When do you make these recipes? How long will I know there good for? Thanks for sharing your weekly plans. I love seeking ideas of how to use common ingredients as I shop & build a plan myself. Helps this busy mama tremendously! I made the lemon/dill chicken salad with the breast of the precooked chicken, then used the legs and thighs in the chicken cacciatore. Got a large can of tuna and doubled the veggies. My daughter and I have eaten for 4 days on those three recipes plus some fruits and yogurt. Thanks for the help and the money savings! I bought the cookbook a long time ago, and am going back through in an attempt to get back to eating more healthy! I found the meal plans and I am so thankful! Thank you so much for taking time to do these. So amazing. These are a lifesaver! Thanks so much!! I was JUST told about you and these plans… SO EXCITED! THANK YOU! Your meal plans are awesome, your photos are awesome. YOU are awesome Gina. Meal plans have given me structure and lots of great recipes. Please continue! I’m finally over the plateau. I cook for husband and 94 year old mother who lives on her own but loved the stuffed eggplant parm (so did I) boats and your western omelette muffins and just about everything! Thank you. And how about your take on icebox cake. Love these, definitely using them so please continue to post them!! LOVE your recipe for Spinach ricotta tomato quiche! I made it for my hubby and I, great weekday or weekend breakfast, thank you for inspiring me with new ideas!!! I am trying your meal plan for the first time this week! So far, I’m in love. The chicken salad was so good!! And I am a huge fan of mayo based chicken salad…. Now to see how my carnivorous husband will rate the mushroom burgers! I have only just realised that the weekly meal plans that I get in my inbox have a printable shopping list too – I have started using as of today and will be following this avidly for the next few months as it really helps not to have to meal plan. SO grateful for you taking the time to do this as all the recipes are brilliant and I don’t have a fussy family. I feed 4 plus, on occasion, students we host from abroad, who they always seem to like the recipes too. I have shared your website and recipes far and wide! I live in Edinburgh, Scotland, and find the recipes very do-able even though I sometimes have to Google the equivalent ingredient names here! Absolutely LOVE the meal plans! With 3 under 5, I am constantly busy. Having healthy meals planned with a grocery list saves me SO much time! You’ve given me precious play time with my littles. 🙂 Thank you!!! LOVE the meal plans! My 16 year old daughter and I enjoy making them together and both of us have lost weight while having fun! Please keep the meal plans coming! Thanks!! I know this may be a lot to ask, but is there any way the meal plans can be posted /emailed either Friday or Saturday? I work during the week- normally put together my meal plan on Fri night and then shop over the weekend. Sometimes I can squeeze some meals in with ingredients on hand but usually I use this weeks meal plan items the following week. Not a horrible thing, but would be nice to be along on the ride at the same time as everybody else. AnywY, just food for thought.? I usually post Saturday! Check on my blog Sat before noon! Gina, I just started counting calories (again) and your meal plans have been a LIFE SAVER (and changer!). Thank you for making these available. It is so helpful to be able to quickly see what I am going to make to feed my family AND stay within my calorie goal. Last week was my 1st week of tracking food and I was able to lose 3 of my 15 lb goal. I know I wouldn’t have been that successful without the help of your meal plans! Thank you! The menu plans are very helpful to me, thanks for taking the time to put them together! Although I absolutely love your meal plans, can you include some kid friendly meals as well? Please? Love your meal plans and recipes. As a longtime weight watcher and recent vegetarian I find them very helpful. Thank you for your inspiration. 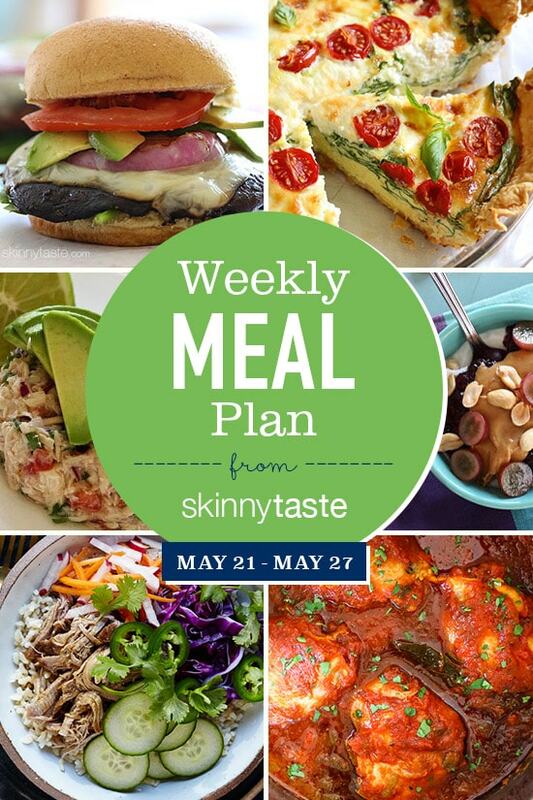 Just found your website, thank you for the free weekly meal plans! Also for all the GF options!! I’m so excited to eat healthier, simpler, and try some new meals this week! We’d love the chicken Tzatziki bowl on the menu! It’s an incredible recipe! 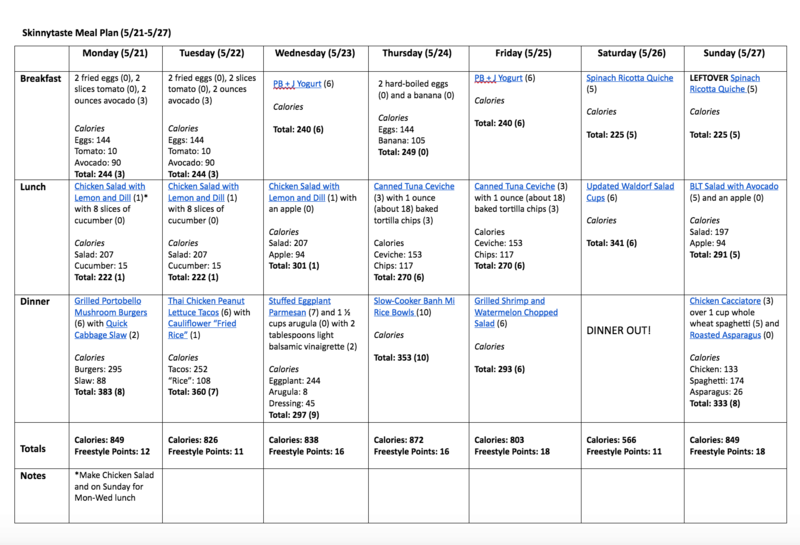 I made my own meal plan this week using all of your recipes! It will be a week of grilling and one night I will attempt that AMAZING looking quiche. I have never made quiche so I am a bit nervous. I love your recipes. I have both of your cookbooks and will order the next one!